This is an official U.S. Government site. Unauthorized attempts to upload or change information on this site are strictly prohibited and may be punishable under the Computer Fraud and Abuse Act of 1986 and the National Information Infrastructure Protection Act. DISCLAIMER - While the general information presented on this site is deemed accurate and correct, it should not be cited or relied upon as legal authority. It is highly recommended that legal advice be obtained from an attorney or legal association. 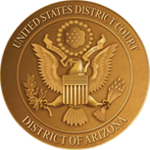 Please refer to the Federal Rules of Civil Procedure, the Federal Rules of Criminal Procedure, and the Local Rules for the U.S. District Court for the District of Arizona.